Thanks for the date of the last video, Rumpole. Yeah, I could tell it was old by all their hairdos. Finally a video with Kelly playing the piano! I've been reading about Jamie Morrison's new venture, PopMorrison, since it launched. But today I find this new video posted at official YT account -- with a different drummer. I hope Jamie is only taking some time off and will be back with the band when they tour in June. And that can't be Richard Jones. If it IS, he needs to keep that hair style because it makes him look 20 years younger. Watched again ... don't think it's him. And Kelly and Jakki welcomed a baby girl last month. Their first child. He has two girls from a previous relationship. I think I'd make a great nanny for them. That vid is old.. as in from past... drummer is guy who popped up in earlier vids.. after Stuart died. Okay, thanks! The fact that it was posted yesterday fooled me. They usually post current stuff. 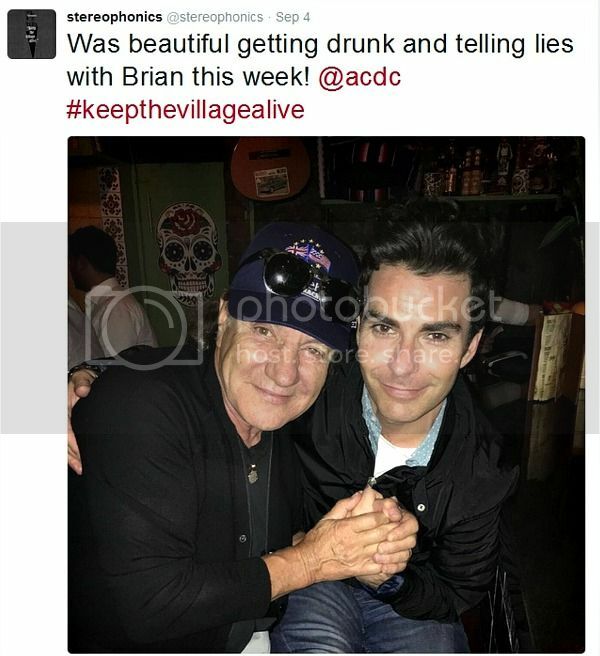 Kelly Jones spending time with Brian Johnson, lead singer for AC/DC, at the end of the Stereophonics' Summer Tour. Last edited by Molly on Mon Sep 05, 2016 4:15 pm, edited 1 time in total. The Cwmaman rockers have announced they plan to release the as-yet-untitled follow up to their number one LP Keep The Village Alive - their ninth - as early as spring 2017 to mark the group's 20th anniversary in showbiz. “We’ve pretty much finished the album already," says prolific songwriter Kelly, who found fame with his debut record Word Gets Around back in 1997. Stereophonics "Lying in the Sun"